Noddle only offers basic reporting, but it still gets the job done, and for one of the lowest prices around. 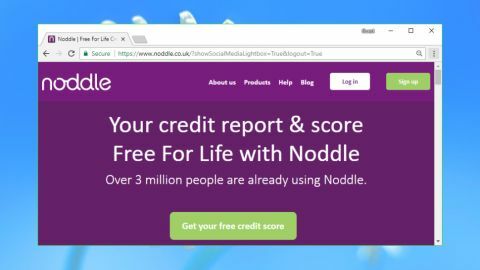 Noddle is a popular service which provides lifetime free access to your Callcredit credit report and score. Yes, that's free forever. No expensive monthly subscription, no need to purchase some other product, no selling of your personal details or anything else. Sign up, access your details – that's it. Noddle has to make its money somewhere, so you will find plenty of ads for financial services like mortgages, and if you sign up for one of these, the company will take a commission. But the ads are less intrusive than you'll get with many websites – there are no popups, no auto-play audio or video – and if you prefer, you can just ignore them. The free service does have one catch, and it's a significant one. Although Noddle displays your current credit report when you sign up, after that the free plan only gives you updates every 30 days. If a fraudulent action crops up a day or two later, it could be four weeks before you're able to spot it, which may well be too late. As a result of this delayed action approach, the free service also doesn't offer you any of the automated notifications or alerts that you'll get elsewhere. To counter this, the company offers a couple of commercial add-ons. Noddle Alerts automatically alerts you within 24 hours of key changes to your credit report, and Noddle Web Watch scans the dark web for any sign of your financial details, email address or phone numbers being sold online. You can buy these individually for £20 a year, or combine the two for an annual £30. In a world where other companies often charge around £15 a month or £180 a year, that's a seriously good deal. Even if you don't want to spend any cash at all, Noddle could still be interesting. It's a long way from a real-time service, but checking your credit report every 30 days is better than never checking it at all, and if you don't want to pay £15 a month, forever, using Noddle instead should make you a little safer. We signed up for the service to find out more. Registering for a Noddle account requires handing over your name, date of birth, phone number, recent addresses and the details of one credit or debit card (for validation, not payment). There's also a follow-up quiz, where the site asks questions about significant events in your financial history: when you opened your current account, which credit card did you sign up for in 2012, and so on. It's a minor hassle, but you only have to do it once, and overall we're glad to see Noddle is doing its best to keep your credit report safe. Once you're over the signup hurdles, Noddle becomes much more straightforward. There's nothing to activate and no complicated console to browse: instead, the site immediately displays your credit score and gives it a rating out of five. Further quick summary panels are available to tell you the average score in your area and the country (these were the same when we checked; a coincidence, or a bug? ), the number of searches on your report in the last 30 days (a possible indicator someone has tried to take out a financial product in your name), and your current short and long-term debt totals. There are quite a few finance-related ads dotted around the page, along with tools to help you find the best loans and credit cards based on your credit score. That's only to be expected with a free service, though, and there's nothing intrusive, no animations, pop-ups or anything else to get in your way. The heart of Noddle lies in its detailed credit report, where you'll find a breakdown of every part of your financial life. Available sections include Personal Information, Financial Account Information, Short Term Loans, Search History, Address Links (previous homes and other addresses linked to your details), Connections and Other Names, Electoral Roll, Public Information (bankruptcies, insolvencies, court judgements), Notices of Correction and CIFAS warnings. The Financial Accounts tab is one of the most important areas of any credit report, and Noddle's is very well organised. The initial view displays one-line summaries of open accounts, neatly organised by type (Credit Cards, Loans, Other), keeping the page very short and easy to read. Individual accounts can be expanded with a click to get a more detailed look, and you can browse closed accounts in much the same way. Other sections of the report have a similarly clear interface. They're arguably a little text-heavy, and not as innovative as some of the competition (Checkmyfile has far more interesting visuals and graphs), but for the most part they're still simple, straightforward and easy to read. A Download option allows you to save a local copy of the report, potentially very useful if you're using the free plan and need to save the current details so that you can make comparisons next time. This works, but presentation is poor, with the final PDF apparently being a single continuous report which has been sliced into pages at fixed points, even if those run through headings or other text. Noddle still performed very well, though, especially for a free product, and adding the alert and dark web search tools – just £30 a year for both – gives it plenty of fraud-protecting power for a very fair price. Noddle's reports don't quite have the visual style of some of the competition, but it covers the basics well, and the ID theft alerts cost a fraction of what you'll pay elsewhere.